We are leading manufacturer and suppliers of all kinds for spares for non-woven machineries. Our engineers can give solution to all kinds of non-woven bag making machine repairs. We are very sure we can solve any kind of problems in non woven bag making machine with a day or the second day. Fostered with vast industry experience and knowledge, we have emerged as the leading supplier of a Hi-Tech FFN Fully Automatic Box Bag Making Machine. 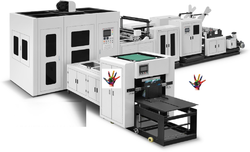 This machine is highly acknowledged in the market owing to its excellent functionality and high operational fluency. Using high class components and sophisticated techniques, the offered machine is precisely engineered by experienced professionals in conformity with predefined international industry norms. Our precious clients can purchase this machine at market leading price. Computer Fixed-length, printing color mark track orientation. Auto-stop when complete. This machine is suited for non woven fabric material, can fully automatic make non-woven bag with different bag size, as a flat bag, shopping bag, gift bag, box bag, handle loop bag, west bag, and shoe bag so on.Technicians introduced the concept of Manufacturing HANDLE bags in same machine with Automatic inline soft loop handle attaching set up. We are counted as a prominent supplier of a premium grade 700 Fully Automatic Non woven Bag Making Machine. Using supreme grade components and modern technology, the offered machine is perfectly manufactured under the strict vigilance of dexterous professionals at our technically sound manufacturing unit. This machine is suitable for making every type of bags. To ensure its functionality, our quality experts test this machine on various quality measures in tandem with set industry standards. IT TOOK LAMINATED FABRIC ROLLS OF 110 GSM TO 150 GSM AS INPUT AND IN SINGLE SHOT AS FULLY AUTOMATIC , IT WILL GIVE EXCELLENT BAGS AS OUTPUT . Looking for Fully Automatic Nonwoven Bag Making Machine ?